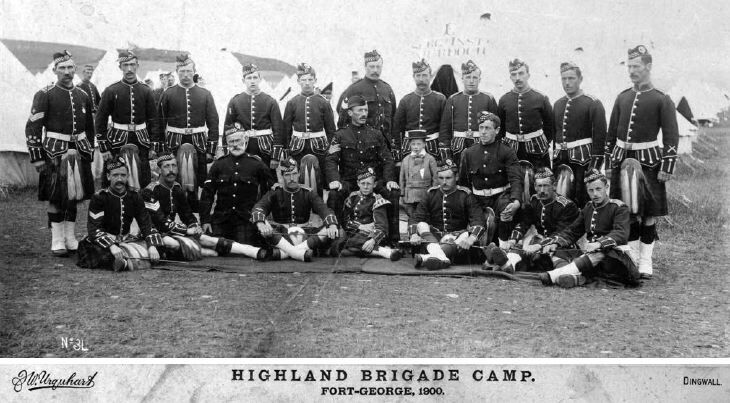 Monochrome photograph of a group of soldiers at the Highland Brigade camp at Fort George 1900. Colour Sergeant W.A. Bethune is on left of group. Group consists of 21 soldiers, of which three are younger boys, with a small boy in civilian clothes in the centre. The photo is pasted onto a card frame with the name of the photographer 'JW Urquhart' of Dingwall. The photo and card are dirty and stained, and the frame is damaged along the edges.